As you may have noticed, the Rad-Lands has been silent for almost seven months now. With Wasteland Weekend just a month away and The Rad-Lands turning two years old on September 1st, I figured it was time I explained what’s been going on this past year, talk about the site, the community, and the future. If you’re not interested in my personal stuff, just know that regular content should resume on Monday, September 3rd. Thank you for standing by. So what happened? The short answer is I lost my job. I had been doing regular audiobook and commercial voice overs for the past two years. Long story short, the client I had an exclusive deal with sold his book rights to another company. I went from working on audiobooks for eight hours a day to having nothing at all. More than anything, this gave me immense anxiety about financial security, especially since I had no benefits. But that’s just how things go in freelance. I’ve spent the last few months looking for permanent work to no avail. The longer answer about why I disappeared completely is a bit more complicated. I had become addicted to Twitter in a bad way. I really craved seeing new content from others, joining conversations, and getting likes to an almost unhealthy degree. 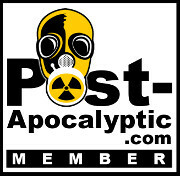 I want to be clear the post-apoc community has been fantastic, welcoming, friendly, and tightly wound. One day in early March I deleted the app and hadn’t looked back since. That provided a sense of finality for a while, completely severing my connection to social media, the tribe, and everyone I’d met along the way. To fill the void and rake in some income, I’ve been running my startup business Formula 47 Wings in the background. Between manufacturing, event preparation, sales events, and looking for a job in the background, the sauce consumed a lot of my time. I’m pleased to say though that in that time we’ve been doing very well. The sauce is in a few stores, won another contest, and now has a website. Expect to see a link to the website in the sidebar. The final straw was May 2018. I was really starting to turn things around and even prepared a new schedule when I lost a few close family members in less than a month. After spending several weeks in hospitals and funeral homes, I wasn’t in the mood to write about the apocalypse. Instead, I started writing for TechRaptor.net. I’ve done a handful of posts for them about game design and interactive storytelling outside of the normal confines of post-apocalyptia. Over time I grew embarrassed about making a return, fearing the inevitable explanation and reception to abandoning everyone and confessing that I had become distant from the post-apocalyptic world. For about two years I “lived” in the world of MUTATION. I could clearly see things happening, I was always writing notes, I had been tidying up a WIP novel, and I felt connected to the fiction. After being away for a while, I stopped living in that world; everything became blurry. That only made it harder to pick up where I left off. I had always intended to come back. For the past seven months, I’ve been silently watching site traffic, seeing it increase bit-by-bit even when I wasn’t posting anything. When I stopped posting we typically got a maximum of 50 clicks per day and 500+ on days where I posted articles to reddit. Now, we get around 75+ every single day. That’s the power of SEO. Getting the site renewal notification and thinking about Wasteland Weekend costumes was what really kicked me into gear. I hear Mark Cordory is coming to Wasteland this year and I’ll be really excited to find him. To everyone that I left behind, I’m really sorry; I just left you hanging. I especially feel bad because I had just done an interview with Evan (From the Wastes) and received a copy of J.J. Shurte’s book “Days Too Dark” before I went quiet. Assuming I can find my footing again, there are a few things I’d like to change in the future. I was getting burnt out doing 3 posts per week. Even then, I had so much more to talk about. All the ideas and categories I had thought up just got to be too much. This is why, for example, there’s only one “Vault Practicality” article and only one “Wasteland Weekend Survival Guide” article. I have enough ideas and things to talk about to fill up a whole week’s worth of content for years, but this is a hobby, not a job. As a compromise, I’m going to switch to a dedicated two posts per week. Mondays and Thursdays with ICYMI social media posts on Tuesdays and Fridays and a highlighted archive post on Wednesday. A new site layout. This WordPress theme has been pretty nice for the past two years, but the homepage isn’t very appealing. I’d like to get a grid homepage with article excerpts. This will make it much easier to find particular posts. I’ll also be revising the sidebar. I have a theme picked out, but it’s premium. Which is why…. Full transparency here. Once things get rolling again, I’d like to have some ads or sponsored content running on the website, the first of which will be a link to the Formula 47 website. At the very least, I need about $100/year just to keep the lights on,, more to really optimize it and get the search results up. If you run a post-apoc website or are into costuming and would like to have a banner on the side bar (even if it’s not sponsored), shoot me an email or a private message on social media. I’ve been saying this for almost a year, but I really want to start doing some videos on YouTube or maybe a podcast. Even if they’re just audio/video versions of articles, I think it’s a big way to increase popularity and visibility. Dude, very excited to hear from you! Sorry to hear about the family, I’ve been in a similar situation myself and I know how much losses in quick succession can rattle you. Take your time with the blog, and don’t force it – anything is not always better than nothing.